You'll want to hike this trail all the way to the end and then some to gain access to the unique views it offers. Jacks Canyon Trail leads up the bottom of a rocky desert gorge where the vegetation is mostly high chaparral. Watch for desert cottontails and black-tailed jackrabbits scurrying through the thorny underbrush. Most likely you'll see some top-knotted Gambels quail, too, and hear them crowing from their hiding places as you pass by. Extensive stands of Arizona cypress carpet the canyon floor along with catclaw acacia, false palo verde, and banana yucca. The trail starts by skirting the boundary of an outlying subdivision, passing through the effects of the 2006, 800 acre La Barranca fire. It then follows an old jeep trail to Jacks Canyon Tank where it drops into the drainage bottom and proceeds along its moderate climb by crisscrossing the dry streambed. At the upper end of the canyon, the trail leaves the streambed to switchback to a high saddle connecting the Mogollon Rim and Munds Mountain. The views are good here, but they're even better a short, steep climb up the Munds Mountain Trail. From the top of Munds Mountain the panorama of the Red Rocks Country is as complete as it gets, including parts of Oak Creek Canyon, all of the major rock formations around Sedona and even the San Francisco Peaks in the distance. Location: 42 miles south of Flagstaff (11.5 miles east of Sedona) in scenic Red Rock Country. Access: Drive south 30 miles out of Flagstaff on US 89A to the Rt 179 intersection in Sedona. Turn left at the traffic light and drive about 7.3 miles to Jacks Canyon Road (FR 793). Follow this road about 3 miles to the trailhead. 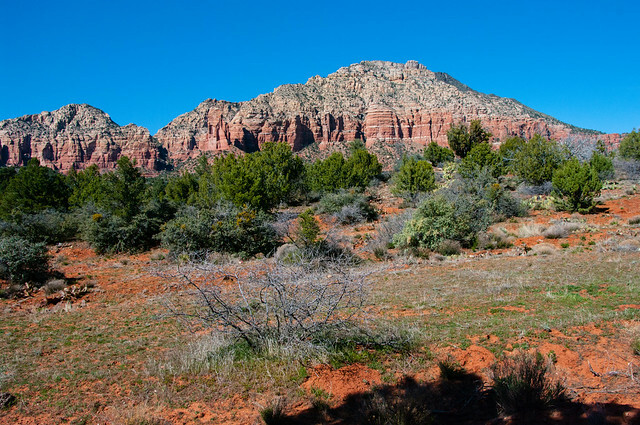 Red Rock Recreation Guide [PDF]: Info on hiking, biking, camping, and more in Arizona's magnificent Red Rock Country. Download the guide or pick one up at the Red Rock Ranger District Visitor Center. The Digital Travel Map Whether you're driving, hiking, riding, or exploring, you will find this full-color, GPS-enabled map a handy reference to have on your mobile device. The map show trails, recreation sites, major landmarks, and forest roads. Click map thumbnail for larger view. No motorized vehicles, no mechanized vehicles in Munds Mountain Wilderness. This trail does not receive regular maintenance, and may have a few trees down across the trail.